"Kids don't care how much you know 'til they know how much you care." This is a favorite saying of Pastor Charles N. Patrick, native of Birmingham, Alabama, who in 1990 founded Sunago Christian Fellowship Church, and has over 40 years experience as an entrepreneur. He is the founder of Fragment House Mission International and former superintendent of charter high school campuses in the Los Angeles County area. He is currently the principal partner of GEM Environmental Services, LLC, a company providing services to school districts, homes, and commercial building with products that rid the environment of harmful and fatal pathogens. His work with high school age youth will be expanded in the management and development of young people in Newberry Springs. Gwen Patrick works as Pastor Charles’ partner in ministry – Co-Founder of Sunago Christian Fellowship and Founder of Titus 2 Women mentorship organization, designed to develop youth leadership in college age and teen age young girls and women. She has served on several executive boards of ministry and in politics and is former principal of the pregnant mothers/teen parents campus of Fragment House. Mrs. Patrick assists in development of programs and planning for Camping, Conference and Learning Center projects. The Patricks have been married for 38 years and have 5 successful adult children and 5 beautiful grandchildren. 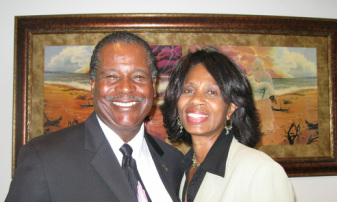 They currently attend Abundant Life Covenant Bible Church, Pastor Camille Russell Wooden, in Pasadena, California. They believe that the Lord has given them this land to develop their passion to reach young people who have leadership potential but live in an environment that is toxic – hindering them from becoming successful in life. Foundations For Future Generations in Newberry Springs, California, will give them better hope of a future in a loving, caring, Christian environment in the midst of God’s country, - where leadership, self-discipline, personal responsibility and love are the rule. Join them as they build Foundations For Future Generations; the Dream in Newberry Springs!